Uber Shifts Gears in Spain to Build Brand – StratGo Marketing. Plug-in marketing department services. Uber is an agile marketer and tenacious competitor. The company is known for disrupting (positively, for the public) the taxi/car ride industry. Vision and execution bring me to what Uber is doing in Spain. In December 2014, a Spanish court ruled that Uber could no longer operate its UberPop car sharing service in Barcelona. Instead of being hamstrung, the company made a smart and creative brand-building pivot. Uber switched gears to nurture its developing brand equity and maintain its business platform foothold. In February, the company launched UberEats. UberEATS – Barcelona, Spain. Translation: From hungry to happy in 10 minutes. Photo Credit: Uber. According to the intro blog post, UberEATS is “an on-demand food delivery service that gets you the best meals from the best local restaurants in under 10 minutes.” (Uber has a similar Uber Fresh service in Los Angeles). “Together with Plateselector, one of Barcelona’s best foodie guides, UberEATS works with the best local restaurants to create a changing selection of lunch and dinner meals that you can get delivered within ten minutes and to an address of your choice. 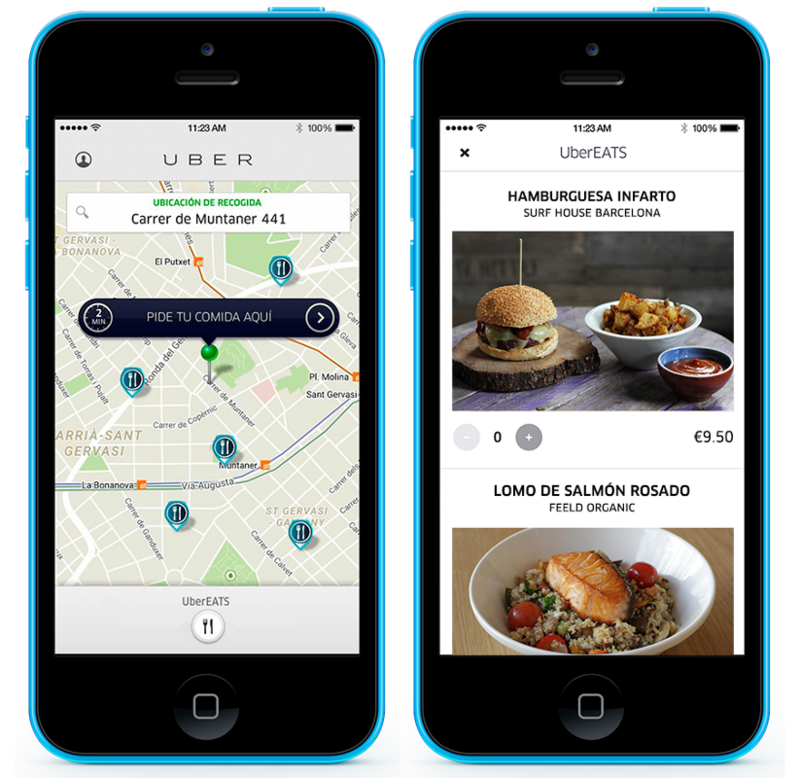 UberEATS smartphone app – Barcelona, Spain. Photo Credit: Uber. Uber’s strategy is impressive for long-term business development and brand-building. They’re taking a core competency – custom delivery from point A to point B, via an easy-to-use smartphone app – and building an extendable branded service platform. The food delivery service may end up being a standalone success, or a tactical path to a more lucrative business objective. Instead of calling it quits in Barcelona, Uber pivoted. It was strategically relevant for the corporation and for the brand vis-a-vis consumers. Uber will be well-positioned for the day when regulations permit the re-booting of its car service. Don’t fear change. Embrace the opportunities it can provide.